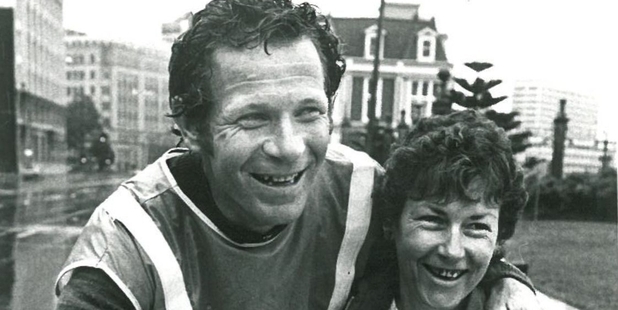 LONG HAUL: Brian Lambert with his wife Barbara after he biked from Wellington to Auckland in 1984. Record-holding Masterton cyclist Brian Lambert will be participating in a special bike race today as part of the Huri Huri Bike Festival, Pedal for Parkinson's. Mr Lambert, who has Parkinson's disease, has been riding for "60 odd years". In 1984 he biked from Auckland to Wellington in 19 hours, 59 minutes and 27 seconds - a record that still stands. "At this stage of my Parkinson's I'm having trouble balancing," he said. "But on the bike I don't need to worry about anything, I could read the paper while I biked if I wanted." Mr Lambert said it was important to keep fit and active with the disease, and said that was the best medicine there is. "With Parkinson's, exercise is better than taking a bottle of pills. If you don't do anything you'll just stagnate. "On the bike I can just do anything I wish. It gives me a lot of freedom. I just hope I don't fall off and cark it." For today's race, which starts at Gladstone Vineyard, he will be riding the 30-year-old bike he used when he cycled from Wellington to Auckland. Huri Huri organiser Catherine Rossiter-Stead said there would be more than 50 people participating in today's big event, which starts from 11am, including Ruth Sutherland who also has Parkinson's. "As Huri Huri continues to grow, so does the Pedal for Parkinson's ride," she said. "It's a signature event for the bike festival, giving ordinary road cyclists an opportunity to warm up the infamous Admiral Hill climb ahead of the world's premier riders. "Huri Huri is a community event and one of the aims is to help people to get on their bikes and be active. "Supporting a vital organisation like Parkinson's Wairarapa, one that helps so many people in our region to remain active, we hope will go some way to help."